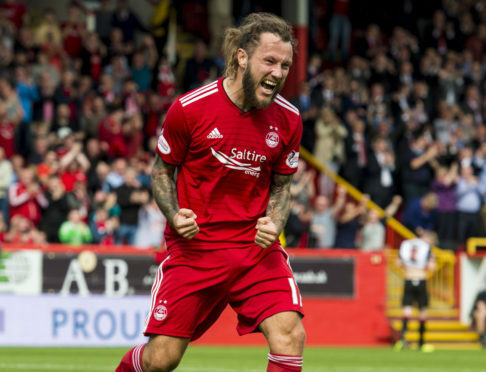 Stevie May is ready to put himself first in front of goal. Press and Journal columnist, former Dons striker Duncan Shearer, urged the Aberdeen forward to be more selfish in front of goal after watching the former St Johnstone attacker open his account for the new campaign in the 4-0 win against St Mirren in the Betfred Cup last weekend. May is eager to add to his first goal of the campaign when the Dons travel to Hibernian today and he is ready to be more single-minded up front. He said: “How do I become more selfish? Just shoot. The manager spoke to me about it, he wants me to get back to shooting on sight. “As a striker you are judged on goals but when the goals are not coming you maybe try to do more for the team to be involved. “But that takes you further away from the goal so you have to get back to playing centrally and hurting teams. “Shooting from various positions and playing on that instinct served me well when I was younger so I need to get back to that. May knows he needs to improve his goal return with Saturday’s strike just his second since November 2017 and his first since netting in the 4-1 win against St Johnstone on March 31. The Dons striker knows he needs to improve his tally but insists he is not feeling under pressure. He said: “My aim this season is to score as many as I can and hopefully help the team to success in the league and the cups. “As far as I saw it, last season was done and I wasn’t thinking about that any more. The St Mirren game was really the second game of the season for me so it was good to get off the mark. “Hopefully I can keep it going and go on a run of goals now. James Wilson, who joined the Dons last week from Manchester United on a season-long loan, joins the squad for the first time after missing the cup-tie due to an ankle injury he suffered in his final match with United’s under-23 sides and May has welcomed the fresh competition in the forward line. He said: “Getting James in is a good thing because competition is healthy.